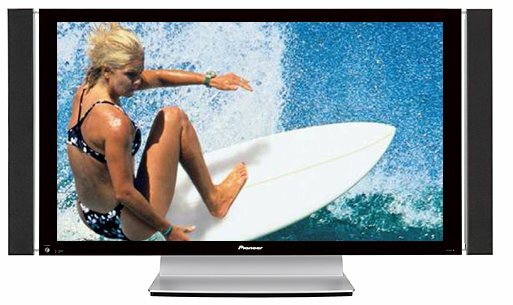 The PDP-5060HD Purevision plasma TV from Pioneer delivers the company’s customarily accurate, pleasing image quality in a relatively affordable 50-inch package. With a 1,280-by-768 native resolution, the 5060HD improves the image quality of its predecessors, has a good selection of A/V features, and does a decent job of concealing the company’s cost-cutting measures. The plasma’s Media Receiver is an external set-top box that incorporates the A/V inputs. Annoyingly, using the display’s two HDMI inputs disables the two component video inputs on the rear of the Media Receiver, leaving only the front-accessible component video input active, and vice versa. I like that the panel’s brightness setting important for preserving dark details was practically perfect right out of the box. Color (saturation) and tint levels required only minor adjustments to bring the secondary colors to near-perfect fi delity, while the ANSI contrast ratio is the best I’ve seen from a plasma display to date. The HDTV does an excellent job of suppressing noise and retains image detail well. Its image quality appeared slightly soft to me, but that helped mask noise artifacts often associated with pixel-based displays. Although I could have done without the tiresome component video/HDMI switching “feature,” the PDP-5060HD is a solid choice for home-theater enjoyment.